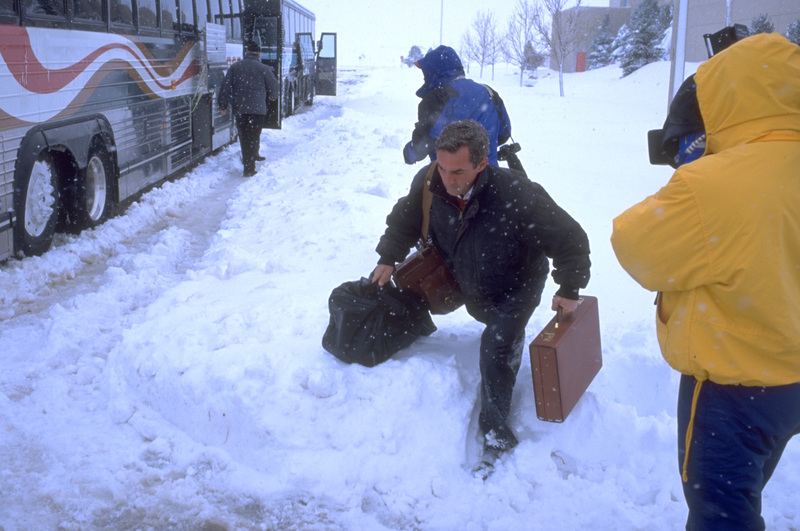 Head Coach Mike Shanahan carries his bags through piles of snow to the waiting buses as the Broncos prepare to trek to Denver International Airport to make it to Buffalo for their game a day later; Oct. 25, 1997. The Broncos defeat the Bills 23-20 in overtime at Buffalo’s Rich Stadium, a mere 15 hours after arriving in Buffalo due to a severe snowstorm that dumped more than a foot of snow on the Denver area with drifts piled several feet higher in some areas. The Broncos’ chartered flight leaves Denver 10 hours late at 8 p.m. (MT) Saturday, Oct. 25, after an ordeal that involves numerous players’ vehicles being stranded in snowdrifts trying to reach the team buses at Broncos headquarters. Several players make their way to headquarters by way of snowmobiles after being picked up by citizens.